‘Negoro no Komizucha’ was a brave warrior-monk of Negoro-ji (here Konrai-ji) in Wakayama, which was becoming too powerful to be tolerated by Oda Nobunaga and Toyotomi Hideyoshi. ‘Komizucha’ was a Herculean figure, specialising in the use of a huge pole, with which he could fight several enemies simultaneously. 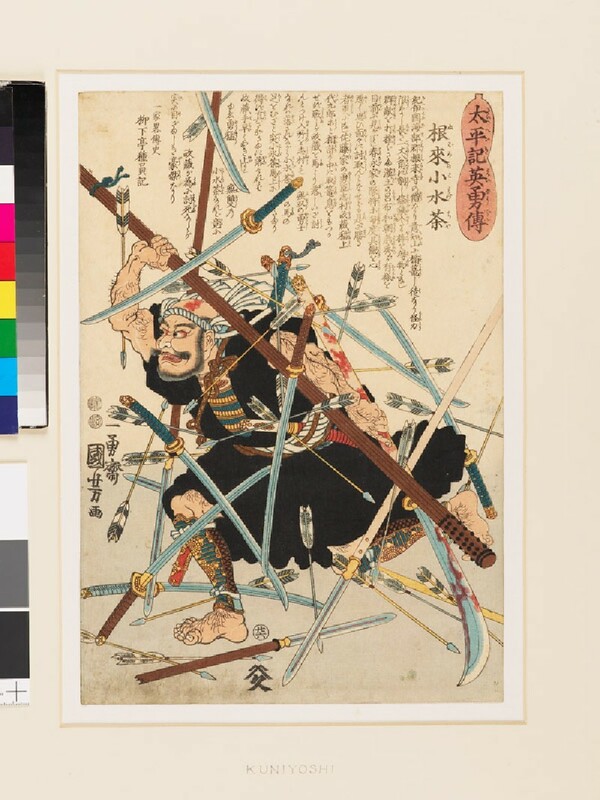 He was therefore said to be a second Benkei or, according to Kuniyoshi on this print, Ryofu of the Suikoden. In 1585, when Hideyoshi attacked Negoro-ji, ‘Komizucha’ was surrounded and attacked by Kimura Matazō (here Shimura Masazō) and Inoue Daikurō (see No. 13) [EA1971.58], followers of Hideyoshi. This print shows this attack and the gallant ‘Komizucha’ dressed as a warrior-monk. Here with enemies on all sides, he holds a three meter pole and a broken bloodstained naginata to ward off the enemy’s shower of swords and arrows. Japanese warrior-monks were known for their skills in martial arts. This is the monk Komizucha from the Negoro monastery, wearing his monastic habit over a foot soldier’s uniform and a headband instead of the usual cowl. The scene is based on an incident that took place during a long siege held at the Ishiyama Honganji temple in Osaka between 1570 and 1580. 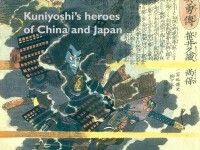 The fearless Komizucha charges into battle with his enormous club while swords and arrows rain around him, but is eventually killed and the temple burned to the ground.